Michael Cain mixing audio tracks. 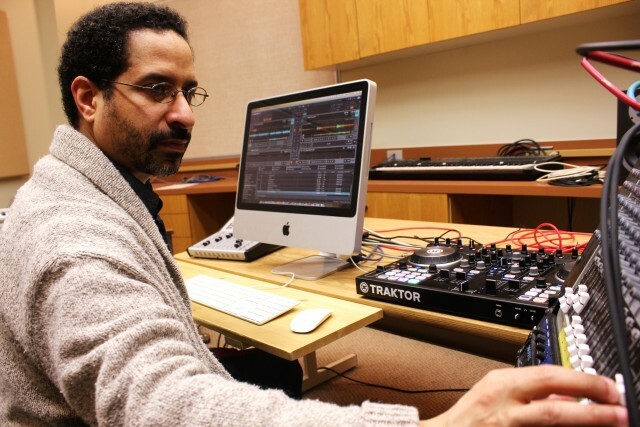 “ I’m also using DJ techniques in my live performace, so I now have a traktor setup that I’m experimenting with,” says BU Associate Professor and Composer Michael Cain. Music manuscripts have long been a source of information on how composers work. Mozart appears to have written his music out perfectly the first time, while Beethoven and Brahms scratched things out or glued corrections over top of their initial ideas. But the introduction of computers and recording technology may ultimately erase the role of the pencil and paper, eliminating clues as to how a composer’s mind works. Dr. Carrabré still uses a pencil at his small desk in the School of Music—although it is a mechanical drafting pencil—but the large format monitors and studio speakers tell a different story about the modern creative process. On the jazz and contemporary music side, Professor Michael Cain’s studio looks remarkably similar, with several keyboards and a desk covered by studio speakers and a large monitor. His creative process also begins at the piano, before taking an even bigger leap to the internet. “When I work with other musicians, they can live anywhere in the world,” says Cain. “After recording my initial ideas I send them to my collaborators to add new details.” It is a multistep process that includes electronic editing and sound manipulation. Whatever the fate of paper and pencil, BU’s composers are happily exploring the potential of new technologies and collaborative creative processes. Now it will be up to future generations of musicologists to follow their electronic editing trails. This article first ran in the first issue of GameChangers, a publication produced by the Office of Research Services and the Office of Communications.